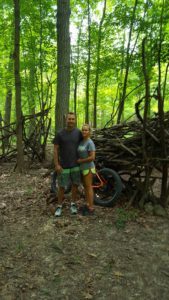 Up North Guided Tours is your premier Northern Midwest FATbike and Snowshoe Guided Tour, Equipment Rental, and Apparel Sales company. 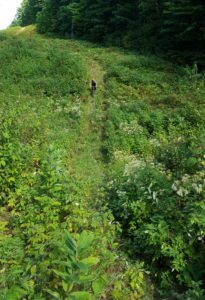 We are available during Summer, early-Fall, Winter, and the dry portions of Spring Seasons in Cable, WI up in the Northwest corner of the State with your reservations made in advance. 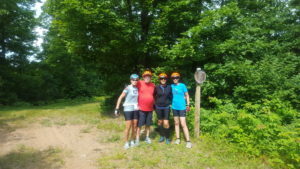 We offer the Outdoor Recreation Seeker’s dream! 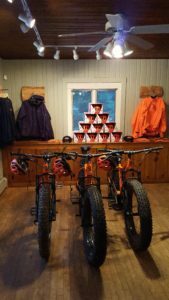 At our core we are a Fat Tire Bike and Snowshoe Guided Tour Outfitter, but we also provide you with high-performance Equipment Rentals for your own self-guided tours, and we carry high-quality Apparel to keep you comfortable while out in the woods. You may be asking, what are FATbikes? FATbikes or Fat Tire Bikes are an extension of mountain biking: they are mountain bikes with substantially wider wheels. We also refer to them as Snowbikes and Icebikes depending on the Winter conditions we happen to be experiencing at any given time. 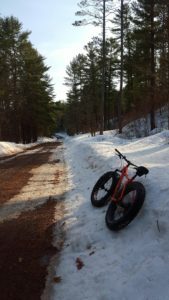 You may also be asking, why FATbikes and Snowshoes? 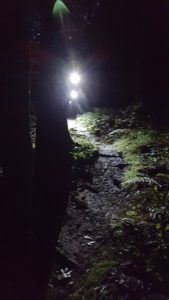 Because they make remote areas of the woods more accessible, and they are fun outdoor group activities that get you into amazing natural places! 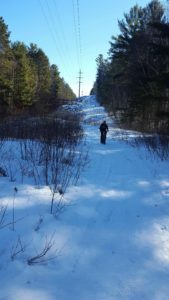 Snowbike on Powerline Winter Trail we Maintain. HVN late-Winter of ’18/’19. 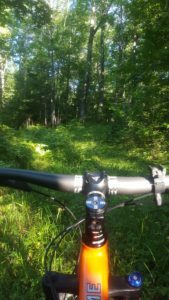 Come Ride Beautiful Chequamegon Gravel in the Spring! 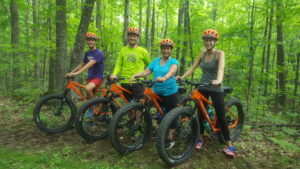 Up North Guided Tours offers 4 great tours in Northwest Wisconsin that are tailored to any skill level so you can enjoy outdoor places you will not find on your own while having group fun! Our tours range from 90 minutes to 7 hours, and we do guide tours during both day and night hours. Discover Wisconsin came by the Shop for a Custom Fitting, Some Instruction, and a Ride! Illuminate the Night! Take our Night Tour for a Change of Perspective. Simple, versatility and stability. Wide wheels on bikes not only can be ridden over most types of terrain under most weather conditions (with a couple simple component switch-outs), they create more rider stability, which flat out enhances your experience! We custom fit you on one of our Borealis Flume Fatbikes and provide you with a Specialized helmet as a part of your guided tour or equipment rental package since we know a good fit and quality equipment matters to you. Yes, our equipment is sweet and we are ready for you regardless of your height!!! Because they are the most accessible, purest form of silent backcountry travel. Our snowshoes have great easy-on/easy-off bindings that stay taut in the deepest of Northwoods’ snow! Using our Tubbs snowshoes/poles/gaiters, coupled with your layered clothing, you are ready to access routes with us or on your own and take in great views deep within the untracked backcountry of Cable, WI. This is a great way to get a group to places most people don’t get to see!!! Cable is located in Northwestern Wisconsin and has incredibly expansive recreational resources: from river headwaters to some of the clearest lakes in the State, from County to Federally managed rolling forestlands, we all can enjoy hundreds of miles of paddling, snowmobiling, all forms of pedaling, hunting and fishing, Nordic skiing, ATV/UTVing, snowshoeing, sail and power boating, hiking, trail running, camping, floating, and relaxing in G-d’s Country! Cable is long on untouched natural forest/lake/river beauty, as it boasts a diverse species population (black bear to wolf, porcupine to fox, etc. ), and it is short on human population and development. All that combines to make Cable a perfect outdoor person’s getaway. We can show you the way and the very best spots in the region.